Colors: The pharaoh is always a reddish tan color, though some what markings are acceptable. The Pharaoh Hound is a graceful, athletic sighthound. The muscles are lithe, never heavy. The head is wedge-shaped and chiseled. The flat skull and muzzle are long and slim. The small eyes are amber or light brown. The ears are very large and stand erect. The nose is tan and speckled with pink. The teeth should meet in a scissors bite. The jaw is powerful. The neck is fairly long and slightly arched. The brisket is deep and the abdomen moderately tucked up. The whip-like tail is carried down, thick at the root, tapering to a point. The front legs are straight. Removal of the dewclaws is optional. The coat is short and glossy in red or tan, often with white markings. A white tip on the tail is preferred. A white star on the chest, white on toes and/or a thin white line down the center of the face are permitted. Any white on the back of the dog is a disqualification. The svelte pharaoh hound is more than a gracious addition to the home (though it surely is that) ? it is a keen hunter and an exuberant chaser. Although it is calm indoors, it loves to run. It is sensitive, loving, gentle and good with children and other dogs, but it may chase strange animals. It tends to be reserved with strangers; some pharaoh hounds are even timid. It is independent but willing to please. The breed has the unique characteristic of "blushing" when excited, with the nose and ears turning a rosy color. 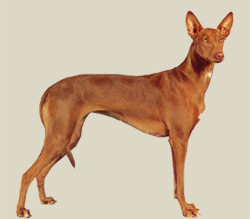 The pharaoh hound relishes the opportunity to stretch its legs in a safe area, although it can manage with long daily walks on leash and occasional sprints. It needs soft bedding and warmth and generally should not be expected to sleep outside except in warm climates ? but it would still prefer to sleep with its family. Its coat is low maintenance, requiring only occasional brushing to remove dead hair. The Pharaoh Hound needs little grooming. It is only necessary to remove dead and loose hair with a rubber brush. Bathe or dry shampoo only when necessary. The Pharaoh Hound is a clean dog with no doggy odor. This breed is an average shedder. Note: The breed is sensitive to anesthesia.